As I watch it rain and think of changing up my fall/winter skin care routine...I can't give up my new love. 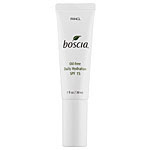 For you oily girls and boys out there, Boscia makes a fantastic oil-free moisturizer with an SPF 15. Extremely light weight and travel friendly. I am a such a sucker for packaging and this company nailed it! This 1oz. moisturizer comes in a tube with a pump! It's also light enough (at this time of year)to layer over other moisturizers you love that don't have any SPF. thanks for posting this! i need a moisturizer with spf that's oil free. i am going to try it.